Oh look, it's Felicity Kendall! 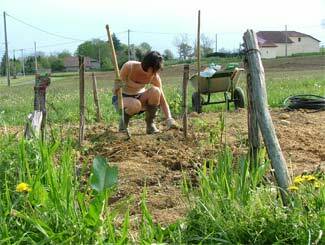 The Good Life starts with home-grown food. Ernest and Alain getting it just right. 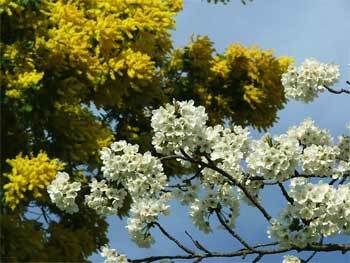 Spring began early this year, more than two weeks earlier than last year. The mimosa and all the fruit trees came into bloom. It was bee heaven. That means we had to get our act together on our vegetable garden. 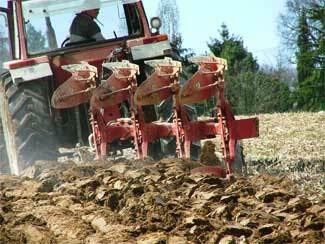 The rotivator was in action, dragging us back and forth across the earth, ploughing up the persistent weeds and breaking down the hardened clay. Karel and Mirjam (the couple we met through this site whilst they were house hunting in France) became regular visitors in March. 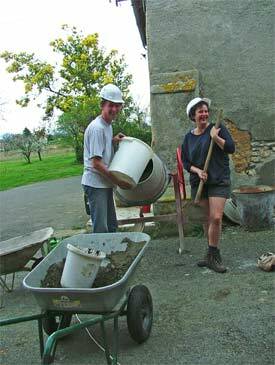 First, to help clear out the chai at the back of the house and then to help mix cement for the footings of our new (old) beams we ordered. The laughter was flowing thick and fast, just like the cement, which none of us had ever mixed before. Caroline Googled for the best mix and order and instructed the labourers from her print out. There was insubordination in the ranks as each decided that their method was better. The resulting mush hardened and is now holding up two rather important beams. So we hope we got it right. The duo were also bidding on a house, not 15kms from us. Their third bid was accepted and a few days later they had to go sign the compromis de vente, a sort of agreement to sell/buy that is followed by the acte authentic once all the necessary paperwork, surveys and finance have been secured. Since Karel and Mirjam's french would be stretched by all the legal jargon, they asked Caroline to come along and help translate where necessary. At the notary, the English sellers turned out to be rather short of french vocabulary too, so Caroline ended up helping them as well. All much to the amusement of the notary, who added Caroline as official translator within the document, which she had to sign, along with both parties. A bottle of bubbles, or two, were popped on the their return as we enjoyed the early evening sun. Looks like we have some new neighbours. Caroline's uncle Remy died after a long illness, which struck home to a very close and extensive family. He was a warm, larger-than-life character and he has a big place in our hearts. We flew to Holland to support Remy's immediate family and join more than 300 souls at his emotional funeral in Venlo. His favourite pastime was managing the wood at the family house in northern France, where he was always busy with an axe and saw. His eldest son likened him to a huge tree that had been felled. His wife, brothers and sisters, children and grandchildren will have to fill the space that this great tree left behind. After conceding that age has begun to take hold, Perry went to get his eyes checked. He came back with not one, but two pairs of glasses. One for driving and the other for working at the computer and reading. He blames it on the hours he spends in front of the screen. He'll need a walking stick next. Hopefully not a white one. Not wanting a fitted kitchen like everybody else, we decided to make it difficult for ourselves and look for a (legal) tropical hardwood work surface. After visiting several wood yards, we were directed to Gers Bois, who have a large selection of exotic hard woods to choose from. The boss was a wag (grapjas), so Caroline and our friend Elisa, soon were chucking jokes back and forth with him. The outcome was an order for three huge 4.5 metre planks, that will be delivered to our door for us to cut to size, on site. Now where's that tape measure..? 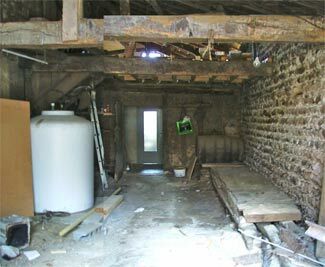 Having given the cement time to dry, we had Alain, the carpenter, over with two old beams he had salvaged from a barn during his travels. His father, Ernest, a retired carpenter, came to lend a helping hand. We set about cutting the beams to size and getting them in place at each end under the weak horizontal beam in the chai. 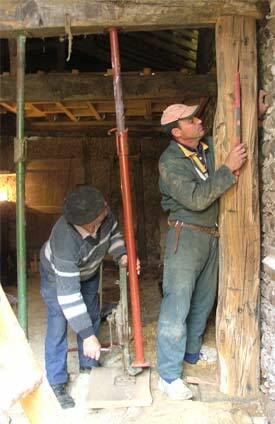 (It had shifted in its hole in the outside wall and needed stabilising before we could put a floor across it.) 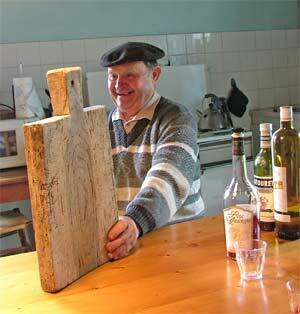 Taking an apéro afterwards, Ernest recognised a chopping board on the shelf, that we had found in the house. "I made that, a long time ago!" Caroline grabbed the camera and captured the moment perfectly. As March drew to a close, we heard them twittering over the fields. Then one by one, swallows dipped and swooped around us, grabbing flies on the wing. A sign that the seasons are changing, but April brings wet weather and the odd, heavy storm. 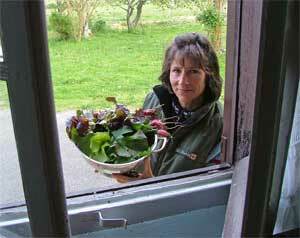 So we will keep our seedlings in their pots until we know for certain that there will be no more frosts. We decided to transfer the contents of the old fuel tank in the chai to a temporary container in the boiler room. This would allow us to then remove the empty, old tank from the chai, so we could dig out the earth floor and lay a cement layer. But since the tap was near the floor, we had to dig out a shallow hole in the hard clay to allow us to get a deep plastic tray under it. Once full, (five litres at the most) the tray would be carried a few meters to be poured into the temporary container in the boiler room, next door. A fine plan, that took us several days, since there were more than 400 litres still in the tank!